Lock in a great price for Pelagia Apartments – rated 9.5 by recent guests! Beautiful space, close to town, easy parking and a welcomebeer! Beautiful appartment with amazing views from the balcony overlooking the town. It was also very close to the town to walk into for restaurants and bars but very quiet. Would really recomend a visit to the monastry in the castle obove the town. We also loved seeing the tortoise in the garden. Spacious apartment, beautifully positioned and wonderful views. Anthony and his father who own and run Pelagia Apartments are genuinely friendly and welcoming, and were helpful and attentive throughout our stay. The apartments themselves are nicely situated overlooking the picturesque fishing village of Koroni, with perfect views of the Mani across the bay, particularly at sunrise. Private and secure, peaceful and relaxing in lovingly tended gardens. Can’t fault it. This is the second time we've stayed at Pelagia - both times we've been given a larger apartment than we booked at no extra cost. We were greeted with cold beers and a bottle of the owner's own olive oil. The apartments are a short walk to the harbourside restaurants in Koroni and, if you don't mind some steps and winding paths, it's only 15 minutes or so to Zaga Beach (and if you're up for several kilometres of narrow, winding road, try Tsapi beach off the Koroni-Methoni road - beautiful and quiet and with a taverna that cooks some of the best roast lamb you'll ever taste). The apartments are at the no-frills end of the scale but ours was very comfortable, well-equipped and had a double-aspect terrace with lovely views over the harbour - perfect for sun-downer of cold rose wine! 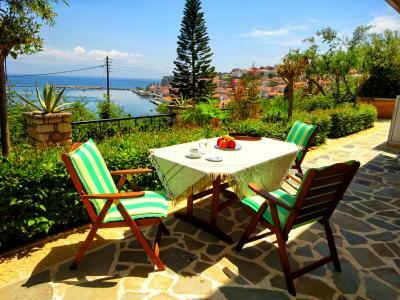 Fab terrace, kind and helpful owner, spacious, lovely gardens and easy stroll to koroni. 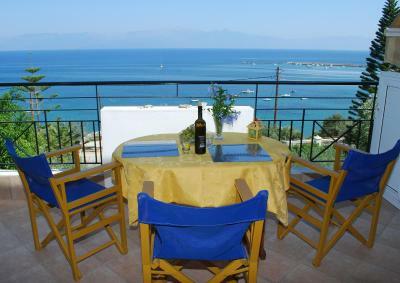 Just 150 feet from the beach, Pelagia Apartments is located in Koroni Town. Set amid a lush garden, it offers self-catering accommodations enjoying Messenian Gulf views from its balcony and patio. Free Wi-Fi is provided in all areas. Simply decorated with bright tones, each air-conditioned unit at Pelagia Apartments includes a flat-screen TV with cable and satellite channels. A well-equipped kitchen with stove, coffee machine and dining table are also available. A tavern is 350 feet away and a mini market can be reached in 650 feet. Kalamata Airport is at a distance of 26 mi. Free private parking is available in the premises. When would you like to stay at Pelagia Apartments? 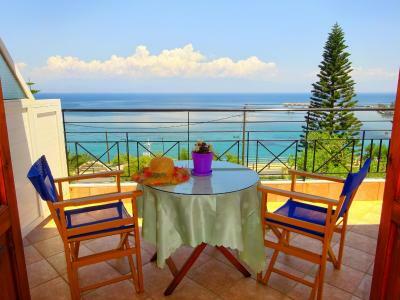 Εnjoying Messenian Gulf views from its balcony and patio, this simply decorated, air-conditioned apartment comes with a flat-screen TV with satellite and cable channels. A well-equipped kitchen with stove, fridge, coffee machine and dining table are also available. House Rules Pelagia Apartments takes special requests – add in the next step! Walking distance into town, with a very tranquil location. Apartment was very clean and comfortable. Will definitely return here! The shower at times lacked power and only came out as a trickle. Parking a little tight, but just about manageable. Cleaning is every 3 days - a day too long for a bin of used toilet paper! This is our second visit to these apartments this year & wouldn't hesitate in going again next year. 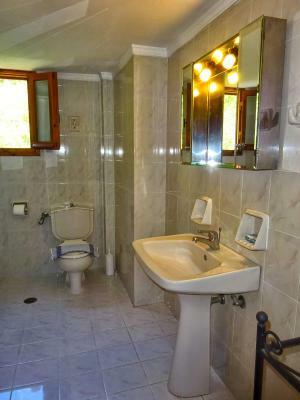 Easy access to the town & also to a small sandy bay with a beach taverna. We had a fabulous view down from our balcony to Koroní and the sea. The garden around the house was kept in beautiful shape. The owners were friendly and helpful. The apartment is large and clean with a large balcony with a great view. 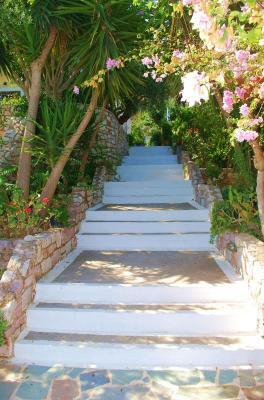 It's a short walk to the town centre and there is a small beach with taverna across the road. Zaga beach is bit further, but also worth the walk. We had a wonderful time at Pelagia Apartments, our best accommodation in Greece so far. And great value for money. Friendly hosts, super clean apartment, amazing view from the balcony. We fell in love with the beach in front of the apartment.